Posted November 17, 2017 by Norburn Lighting and Bath Centre & filed under Tips and Advice . With a change of season comes a change to the amount of daylight we are exposed to each day. The shorten sunlight exposure impacts our daily life and overall mood, which is why artificial sunlight is used in order to gain benefits that would normally be acquired from natural sunlight. HappyLight is a portable light source that mimics light emitted by the sun. It delivers 10 000 lux light, which is the recommended intensity of light that helps improve overall mood. This portable light source is designed with Flicker Elimination Technology which results to no buzzing and flickering, and is also ETL Listed which means it is safe for use. This portable lamp is designed for multiple surfaces such as walls, or on top of tables. This product is best suited for individuals that are affected by reduced sunlight, those that experience winter blues, insomnia, and jet lag. In addition, the HappyLight is also beneficial for those that work in offices, or individuals that work in the evenings as they are exposed to less sunlight. It is also beneficial for individuals that are not able to be outdoors on a regular basis. WHEN IS HAPPYLIGHT THE MOST BENEFICIAL? HappyLight can be used at any time of day that is the most convenient for the user. During day time, the exposure to bright light helps in the production of serotonin which influences an individuals mood and happiness. During the evening, bright light regulates melatonin which aids in sleep. Simply find a comfortable area to set the HappyLight. For effective results it is recommended to not directly stare into the light, but rather angle the light facing the eyes. In addition, it is recommended to make gradual increases to each session, starting with 10 minutes, and increasing to 30 minutes to 1 hour each day. The gradual increase of light therapy will help an individual identify the most convenient and effective daily exposure that meets their personal needs. HappyLight provides the benefits that would naturally be acquired from direct sunlight when there’s just not enough time to get outdoors, or if there are uncontrolled factors, such as weather, that limits the available sunlight. In addition to offering the same benefits as sunlight, the HappyLight does not emit harmful UV-rays. 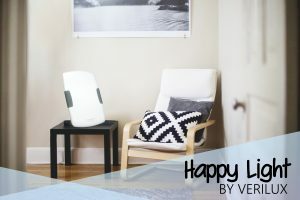 When used consistently, the HappyLight can improve energy, focus, sleeping patterns, and overall mood. For more information on HappyLights contact or visit our showroom, our Lighting Specialist are always happy to help!